Philadelphia ICA, never an institution to shy away from re-contextualising culture and art, has a long tradition of giving certain exhibiting artists free rein to transform the space. And if ever there was a subject worthy of being set loose here, it would be Stefan Sagmeister, who has made a career of sidestepping industry conventions, in favour of roguishly fashioned, provocative work that goes beyond design functionality to exist as conceptual art in and of itself. Any Sagmeister retrospective could fill the ICA’s expansive second-floor galleries and ramp area but this interactive, all-encompassing experience transgresses not only ‘the boundaries of art and design’ but also the boundaries of the exhibition space. From hand-drawn missives on bathroom mirrors and elevator doors to giant inflated monkeys on the building’s exterior terrace, this show occupies every part of the museum apart from the first floor (where another exhibition, ‘First Among Equals’, resides). Beginning with one of the most unusual exhibition invitations ever – plastic-sealed slices of salami from which the word ‘Happy’ had been precisely laser-cut – Sagmeister made it clear that he was embracing the challenge of making every piece play a conceptual role within the larger message. 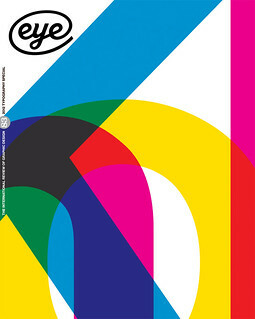 The theme is Sagmeister’s ten-year exploration of happiness (and a precursor, or perhaps companion to, his upcoming feature The Happy Film, 14 minutes of which are shown here). Sagmeister has attacked the theme methodically, picking apart the notion of happiness just as he deconstructed, thread by thread, a pair of Levi’s for a 2009 poster. The resulting mix of art, design and science not so much documents as enacts Sagmeister’s journey – a journey that is equal parts play, self-analysis, biography and tongue-in-cheek deconstruction. The expository, roughly hand-drawn wall texts that appear throughout further personalise the experience, as if Sagmeister is whispering in your ear; they also lend an element of sincerity to a theme that could easily, in other hands, fall into the realm of snarky cynicism. Seductively visual but content-heavy, ‘The Happy Show’ begs close exploration. Filled with many pithy, diary-extracted maxims from Sagmeister’s Things I Have Learned in My Life So Far, there are experiential twists and physical take-aways to await the visitor at every turn. Chocolates, gum, a wall slot dispensing advice cards, and even a bicycle, which, when pedalled, generates segments of a neon wall message: ‘Actually Doing the Things I Set Out to Do Increases My Overall Level of Satisfaction’ – all contribute to a smile-inducing, immersive experience. Especially striking is the ramp installation, a huge infographic on happiness factors, rendered in the vivid yellow and black of police ‘caution’ tape. While undeniably cheerful, this is also vaguely unsettling. 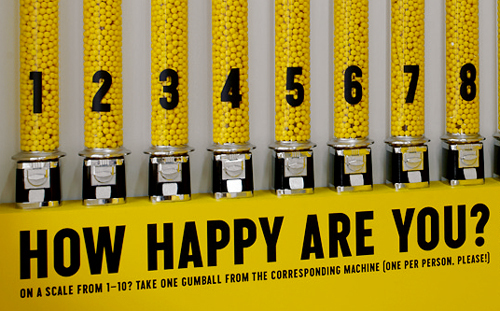 The wall graphics on the ramp are accompanied by a bank of gumball machines, each representing a different numeric happiness scale and topped with tall transparent tanks of bright yellow balls. This piece is an evolving, real-life infographic in itself, in that it will eventually reveal the self-reported happiness levels of visitors as the volume in each machine visibly diminishes. Some older pieces have been adapted or reworked for this show, such as Everybody Always Thinks They Are Right, a piece from 2007 that originally consisted of six giant inflated monkeys, each holding one word from the title and installed in a different Scottish city. Now it has become a two-monkey affair on the ICA’s second-floor; the statement is now expressed with each monkey holding half of it – without the ‘Always’. The title is now Everybody Thinks, which is certainly a more generous – and yes, happy – sentiment. 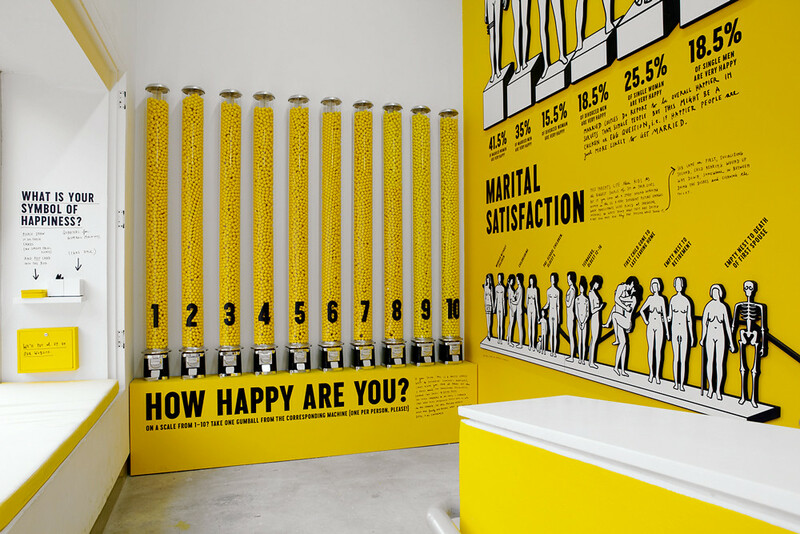 Right and top: Stefan Sagmeister’s unsettling ramp installation on happiness factors from ‘The Happy Show’ in Philadelphia, 2012.